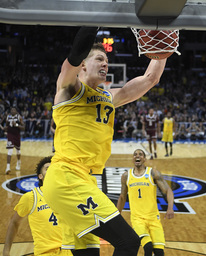 Michigan took all the drama out of this NCAA Tournament victory, burying Texas A&M under a barrage of 3-point shots. After reaching the round of 16 with an improbable buzzer-beater, the Wolverines shot 62 percent from the floor and routed the Aggies 99-72 in the West Region semifinals on Thursday night to advance to the Elite Eight for the third time in six years. Next up the Wolverines will face No. 9 seed Florida State on Saturday at Staples Center for a trip to the Final Four. The Wolverines (31-7) dominated from start to finish, hitting 14 3-pointers - 10 in the first half when they led by 29 points - and extending their winning streak to 12 games. "Felt like we ran into a buzz saw," Aggies coach Billy Kennedy said. "It seemed like everything they shot went in." "My shot went in early and it gives you the confidence to take the next one," Abdur-Rahkman said. "I think everyone had that confidence today." Abdur-Rahkman made four 3-pointers and both of his free throws, and had five rebounds and seven assists. "This senior right here played his tail off in every single way," Michigan coach John Beilein said. "It was kind of hard to see because I was just wondering when they were going to miss," Aggies guard Admon Gilder said. Michigan won its second-round game to reach the Sweet 16 on freshman Jordan Poole's long 3 at the buzzer against Houston. "We weren't focused," said freshman guard T.J. Starks, who had five turnovers. "We didn't show up." Having beaten defending national champion North Carolina by 21 points to get to Los Angeles, Texas A&M's stay was short. "That's the nature of this game, the nature of this tournament," Kennedy said. "You can be high one minute and low the next." The Aggies have yet to reach an Elite Eight, and Michigan made sure they never had a chance. Poole hit the Wolverines' first 3-pointer two minutes into the game. During one stretch, they made 3s on three consecutive possessions that extended their lead to 25-10 and had the predominantly Michigan crowd chanting, "Let's go Blue!" "Everywhere we go we have a huge fan base and it feels like a home game," said Wagner, a junior from Germany. Wagner connected on all three of his 3-point attempts, the first one coming on Abdur-Rahkman's kickout from the paint, one of 21 assists for the Wolverines. "We've been playing within ourselves all year and not looking at the opponent too much," Wagner said. "We've been believing all year we can beat anyone if we play our best basketball." Michigan led by 29 points after an 8-0 run near the end of the first half. The Wolverines averaged nine 3-pointers per game coming in and exceeded that by the break. Michigan held the Aggies to 12-of-32 shooting from the floor by double-teaming A&M and getting hands in shooters' faces. The Wolverines had 12 steals in the game, led by Zavier Simpson with a career-high six. The Aggies committed 10 of their 14 turnovers in the first half. They improved to 57 percent shooting in the second half, but it didn't make any difference when the Aggies couldn't come close to reducing their deficit. Michigan: The Wolverines' points were the second-most they scored this season and second-most of any team in the NCAA Tournament this year. Their 62 percent field-goal shooting was the best of any team in the tourney this year. Texas A&M: The Aggies had relied on their defense all season, but it got shredded. They allowed season-highs in points and field-goal shooting percentage by an opponent. The game aired in the wee hours of Friday morning in Berlin, where Wagner is from. His family had a watch party at home and Wagner's mother said a local bar was showing the game. "A lot of people text me that I haven't heard from in years," he said. "It's a really cool thing, and I'm very proud of that, for sure." Michigan will be looking for its eighth trip to the Final Four and first since 2013. The Aggies head home with a 13-15 all-time record in the NCAA Tournament.